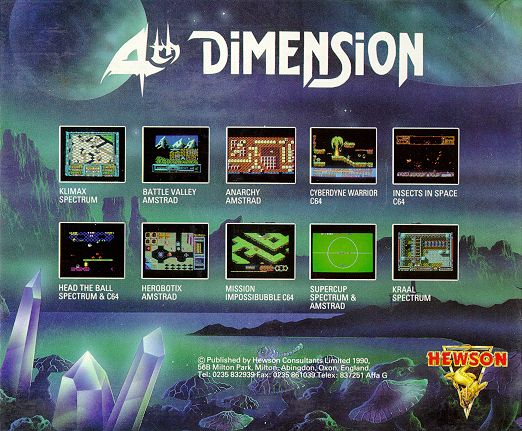 Platform shoot-em-up developed a year before Retrograde but can out about the same time in a four game pack called '4th Dimension' from Hewson Consultants. The game is based around 3 planets, each with an orbiting Prison Satellite. For each satellite captive droids escape and, using on board transporters, beam down to the planets below. As the transporters were built for humans only, the droids self destruct mechanisms are accidentally activated. Unless the droids are recovered within the time limit, the planet will be destroyed and you with it. You are the last CYBERDYNE WARRIOR and it is up to you to locate the droids and return them to the satellite. There are numerous inhabitants who may have to be destroyed in order to reach the droids. You have at your disposal a machine gun which can have its speed and calibre modified, with extra ammunition also available. It is possible to delay the time before the droids self-destruct and you may also purchase energy which may have been lost coming into contact with planet inhabitants. In order to purchase items you must collect money from the planet and transport to the satellite, with at least one droid. From there you are presented with a menu of items which you may buy. You then return to the planet to continue your mission until all the druids are recovered. 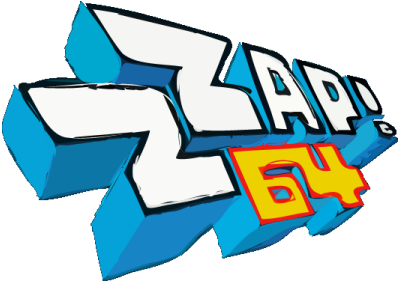 Once the game has loaded, you will be presented with the title screen. 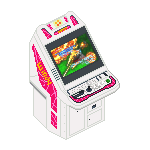 Pressing FIRE on the joystick in port 2 will start the Attract Sequence, and pressing FIRE after the Warrior's visor has lowered will enter the game. (If FIRE is not pressed from the Attract Sequence, it will carry on and when finished enter the game automatically). SPACE: Toggle 'strobe' on /off. When the strobe is on, a bar will appear at the bottom of the screen. (The strobe causes the screen to pulse when the player fires, or kills an alien). RUN STOP: This enables the pause facility. To return to the game, the joystick must be moved or FIRE depressed. Q: If this key is pressed, you will return back to the Title Screen, quitting the current game. SCORE: This constantly displays the players score (6 figures). STAGE: Each of the three planets is one stage and its displayed here. 4MM: Smallest size, weakest impact. 8MM: Largest and most powerful impact. TIME: This constantly decreases, showing the time left to detination. AUTO: The automatic grade of your weapon is displayed and may be between 1 and 7 (1 being the slowest shot speed and 7 being the fastest). AMMO: At the bottom left of the status there is the number of magazines remaining and bullets within the current magazine. MONEY: The amount of money collected so far. L.E.D. : Above money is the status area, there are a series of squares these are the droid collection L.E.D.s. The amount of L.E.D.s displayed are the number of droids required to complete the current stage. (On the first planet there are 5 droids, on the second there are 7 and on the third and final planet there are 10). See DROIDS for information on 'collection and recovery'. ENERGY: Within the status area your energy is represented by a bar. As you collide with aliens or come into contact with planet hazards the energy bar will decrease. The bar also decreases constantly owing to fatigue. Pushing up/down on the joystick will move the menu bar up/down, and pressing FIRE will purchase the item. Purchasing will only be permitted if you have enough money and the current item is not already at its maximum grade. Purchasing Energy will increase your energy level by 10% of its maximum amount. Extra magazines may be bought by selecting the Ammunition option, adding 5 magazines per purchase. The current time to detonation may be delayed to a maximum of 999 seconds by buying Time. The speed that your weapon fires when the fire button is pressed may be adjusted by selecting the Automatic option, increasing the current grade by 1 (maximum being 7). The higher the grade, the faster the gun will fire. Calibre will modify the power of the player's weapon. in effect, enabling you to destroy planet inhabitants with fewer shots. You will be returned back to the planet (and the game) if the Quit option is selected, or if the shop timer reaches 00. (a) Upon collecting a droid, your score increases by 125 points. (c) Droid indicators: When you have picked up a droid, it is classed as collected not recovered. In order to recover it, it must be deposited in the orbiting satellite (which contains the shop). Droid collection is represented by highlighting the current droid L.E.D within the Status strip and shows recovery by fitting it in. (a) Multi coins: These act in much the same way as standard coins in that when they are collected, you receive a cash bonus. Unlike standard coins these constantly animate through the 4 coin value (5, 10, 50, 100). You must therefore time the collection of this coin carefully, to receive the greatest bonus possible. (b) Hidden coins: Throughout each planet there are several hidden coins. These are invisible to the warrior but may still be collected. However, if you shoot one of these, it will flash enabling you to see it. (c) Blindness: If you come in contact with a skull, you will be blinded, i.e. all platforms will disappear (you may still be able 'to see aliens). If you shoot, the platforms are illuminated by the flare of your gun, helping you to see where you are going. You may regain your sight by either collecting a droid or returning to the satellite. [UP], [DOWN], [LEFT and [RIGHT]. The message at the bottom of the screen should now say "Press [FIRE] To Cheat"
So plug the joystick back into Port Two and do just that.